To celebrate the first weekend this year that I didn't have to work, Marcus and I hit up the newly opened Japadog over in St. Marks Place for lunch on Saturday. A brick-and-mortar import from Canada, Japadog was started by a Japanese couple that had moved to Canada with a dream of creating a world famous food stand. With many challenges, especially with the language barrier and initial operations, and lots of hard work, Japadog soon became popular with the general public, particularly during the 2010 Winter Olympic Games in Vancouver, where it had two stands with hundreds of people lining up every day. 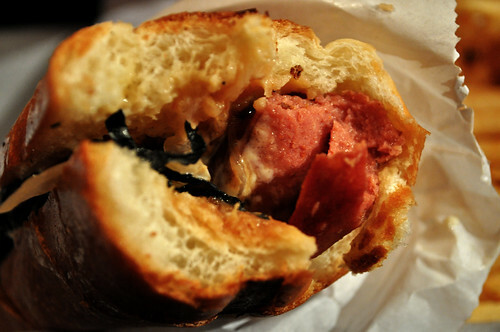 By then, Japadog had expanded to three stands as well as to its first shop, which allowed it to explore different concepts for "the Japanese-style hot dog." 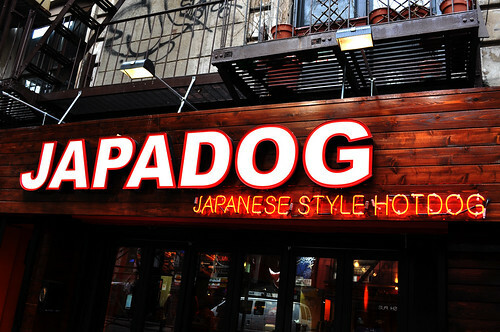 This past January of this year, Japadog opened a location right here in New York City, its first "global" location -- just a month old! 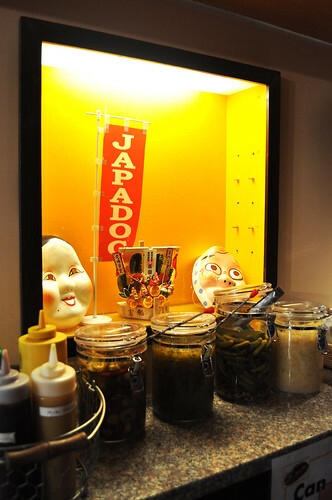 The condiment station at Japadog. Initially from looking at the hanging menu outside, Marcus and I desperately wanted to try the Yakiniku Rice hot dog (i.e., flavored rice with barbecue-style beef on top of an arabiki sausage) and the Okonomi hot dog (i..e, a Kurobuta sausage topped with bonito flakes), but these two menu items were in actuality "coming soon" -- not yet available to order. Alternatively, Marcus had the Love Meat hot dog with homemade meat sauce fused together with melted cheese, and I had Japadog's signature hot dog, the Terimayo with teriyaki sauce and mayonnaise topped with shredded nori (seaweed). The first thing we noticed about these hot dogs was that they were pretty sizable -- not petite like the ones offered at Gray's Papaya or the Asian-inspired hot dogs we've had at Asiadog. The bun was definitely hero-sized, and the hot dog itself was pretty hearty as well. Considering we were going to order two hot dogs each, I'm glad we just stuck with just one instead. Another nice thing about the hot dogs at Japadog is that the hot dogs are cross-cut with small slits along its length, making for easier eating and better cooking and perception of flavor. The terimayo was absolutely delicious -- a well-balanced fusion of teriyaki sauce and mayonnaise with a nice subtle crunch from the julienned nori. The bun-to-dog ratio was exactly what I look for in a hot dog -- just enough bun to go around with each bite of meat. I only urge you to eat any hot dog from Japadog as soon as you get it because the condiments/sauces/accoutrement can quickly become really drippy and cause the bun to become very soggy. Otherwise, the hot dog itself is incredibly juicy and flavorful, so much so that even without all of the Japanese-style toppings, the hot dog would be amazing standalone. The Love Meat hot dog was great, too. 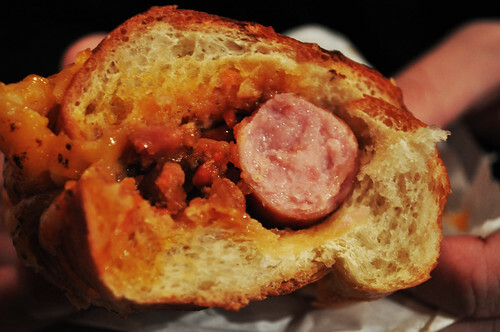 I was a little surprised how the cheesy meat sauce worked so well as a hot dog topping (though, I suppose it's pretty much like a Japanese-style chili dog). The homemade aspects of the ingredients make this a very comforting hot dog, bringing me back to the days of my childhood. I liked that it wasn't overly cheesy because that could turn me off very quickly. We each ordered a "value meal" which came with a side of fries. For the choice of seasoning over the fries, Marcus and I both went with the shichimi and garlic -- roasted garlic with nanami togarashi spice (Japanese hot pepper). Oh man, the seasoning made these fries pop with even more flavors. The golden, crispy exterior and the soft potato interior matched with the garlicky spice made for an incredibly winning combination. It reminded me of the American snack, Andy Capp's Hot Fries -- only this was Japanese-style. 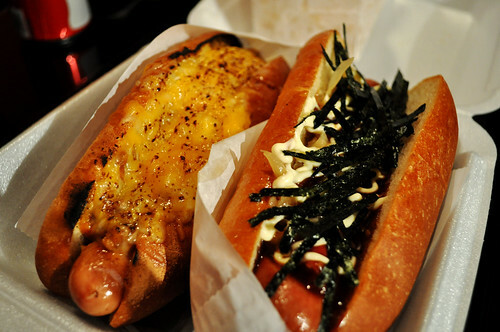 Highly recommended to accompany any hot dog at Japadog! Findings: Overall, Marcus and I really, really enjoyed our quick lunch at Japadog. The hot dogs are incredibly flavorful, and the menu offers a variety of Japanese-inspired toppings that will sate those with a palate for the flavors, ingredients, and spices of Japanese cuisine. Though, in my honest opinion, the best part about Japadog is the portion size: a generously sized hot dog (juicy and delicious, too!) with a very well-balanced bun-to-dog ratio. I'm looking forward to returning for another quick lunch (hoping to try the Yakiniku Rice and the Okonomi) and some midnight snacks at Japadog. 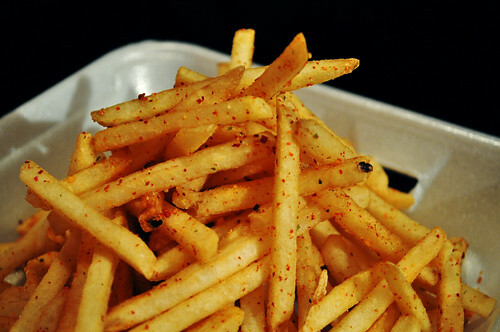 Make sure you order fries if you stop by here -- especially with the shichimi and garlic seasoning! Price point: cash only -- $7.20 for each hot dog value meal, $2 for each can of soda.